Above towns and cities this winter, starling flocks will twist and pulse like giant amoebas in the sky. 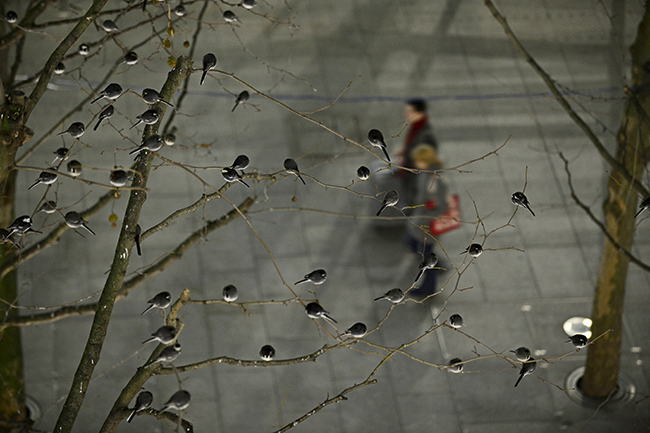 At Terminal 5 of London’s Heathrow Airport, as people scurry across departure halls and up and down escalators, outside in the gathering gloom, pied wagtails will descend in their hundreds to a few dimly lit trees below a multi-storey car park. In contrast, on wild windswept coasts, geese in their thousands will fill the sky as they arrive at their safe overnight roost sites. 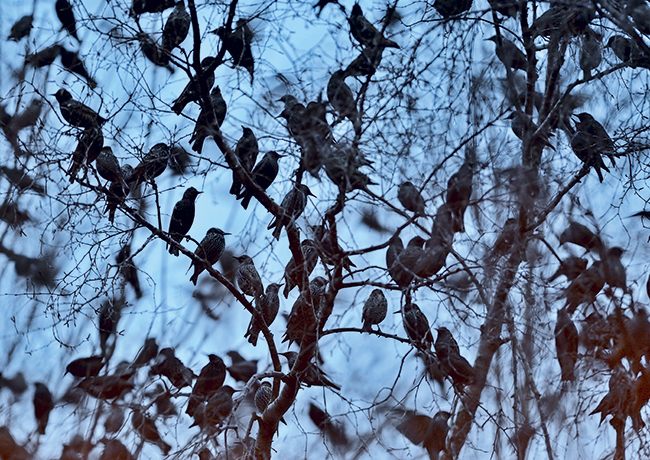 These are just a few examples of avian gatherings that serve up great photography. The spectacle is the flock and, as flocks can be vast, a short focal length lens can often be more use than a telephoto. When half a million starlings are murmurating above Gretna Green in Dumfries and Galloway on a December evening, a short zoom such as a 24-70mm lens is ideal to capture their twists and turns, and ensures the whole flock is included in the shot. The shorter lens will allow the urban or wild environment to be very much part of the picture, too. It is best to arrive well before the birds to scout out roosting locations. Once a roost starts forming, action can be fast and sometimes fleeting. There is no substitute for experience, and I find that I need one or two visits to work out the best spots from which to shoot. The exception to this is when photographing murmurating starlings. When birds of prey are actively hunting, these displays can be spectacular. There will, however, be evenings when the birds fly in and little happens, so visiting over a number of nights will pay dividends. Spectacular roosts are not confined to our towns and cities. Wild geese, and in particular pink-footed and barnacle geese, roost in their thousands at traditional sites around the country. Geese can be photographed both going to roost in the evening and when they leave to feed at dawn. It is those dawn departures that often present the best opportunities, as they may leave en masse, filling the sky. However, one group of birds that roost during the day are knots. They respond not to night and day, but to the tides, and are a favourite with photographers. Once the tide has covered the mudflats on which these birds feed, head for higher ground and look for rivers of knots moving restlessly throughout the flock. Try using a slow shutter speed to create beautiful blurs to give a real sense of motion. Both waders and geese are very susceptible to disturbance, so never venture away from paths to approach a roost. Not only will you leave without photos, but you will also be very unpopular with others hoping to enjoy the spectacle. The beauty of roosting bird photography is that even the shortest of lenses can be utilised, and while often overlooked, bird roosts in Britain can offer some world-class wildlife photography. If you take the time to look, there’s sure to be a roost near you. Photographing murmurating starlings has become popular with photographers in recent years. Some starling roosts may occur at a particular site one winter, but move the next. However, there are a few very reliable roosts around the country. Peak times for photographing starling roosts are from early November through to early February, and you need to arrive at least an hour before sunset. Gretna in Dumfries and Galloway hosts a spectacular roost that has numbered in excess of one million birds. In recent years bird numbers have dropped, but it is still an impressive sight. This roost tends to move location each winter, but is normally within one or two miles of Gretna. You may need to check the internet or spend an evening scouting out the current location. Brighton Pier in East Sussex once attracted a roost in excess of 20,000 birds. There has been a steady decline in recent years, so expect fewer birds, although they will still put on a show. Aberystwyth Pier in Ceredigion can be a great location for shooting flocks of starlings against the pier and the setting sun. Ham Wall RSPB Reserve on the Somerset Levels accommodates a roost in excess of a million birds each winter. Other notable locations around Britain include the Leighton Moss RSPB Reserve in Lancashire and Snape, near Aldeburgh in Suffolk. Pied wagtails flock to town centres and supermarket car parks to roost in winter, as these sites are always a degree or two warmer than the countryside. Trees with Christmas lights are often a favourite. Top sites include the trees lying in the quadrangle between the multi-storey car park and Terminal 5 at London’s Heathrow Airport. In Tunbridge Wells, Kent, a roost of a few hundred birds favour the trees in the paved shopping area at Royal Victoria Place. Many other towns and cities host pied wagtail roosts, so it’s worth searching the internet to find information on a roost near you. Pink-footed geese roost at a number of locations around the north Norfolk coast, including the Wash at Snettisham. View them from the sea wall at Snettisham RSPB reserve. On the Solway in Dumfries and Galloway, close to 40,000 barnacle geese lift off at dawn with many heading over to the Wildfowl and Wetlands Trust reserve at Caerlaverock to graze. This is a great site, not just for photographing geese, but also for ducks and especially whooper swans. Wader roosts are dependent on the tide and at some sites only the highest tides of the year offer good photography. The Wash at Snettisham RSPB Reserve in Norfolk is a popular location. For more guideance on photographing birds, see our guide to bird photograhpy. 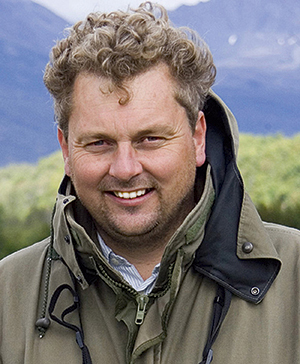 One of the most widely published wildlife photographers in the world, David’s pictures appear on hundreds of book and magazine covers. They have been used in just about every other conceivable way, from wine labels to being projected in New York’s Time Square.